I'm on a blogging roll this week and loving it! I hate when I neglect this blog. I don't know why I don't take the time sometimes to write. It's something that I love doing and hopefully some of you love reading it. 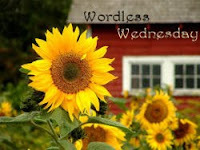 Now, I think it was two weeks ago that I made an attempt at catching up on my (almost) Wordless Wednesday posts. Of course, I totally slacked off last week and now I'm 6 photos behind again! Well, with any luck, I'm going to post 3-4 of those in this post. They won't be new photos because along with blog slacking, I've totally slacked in photo taking, as well. 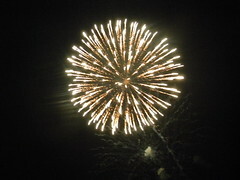 Orange - I'm still mastering taking photos of fireworks. Almost all of mine turned out fuzzy, this year. Open - This is open air! 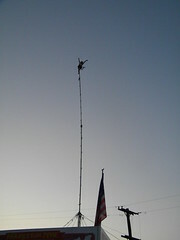 This crazy great-grandma was something like 80' up in the air without a net or harness! 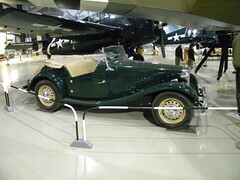 Park - This lovely is permanently "park"ed at the Kalamazoo Air Zoo. People - This year is one of my favorite people, Roger. I think he was in kindergarten when I took this. I love this photo. 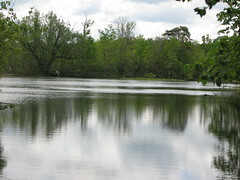 Quiet - I took this the same day that I took the above photo of Roger. 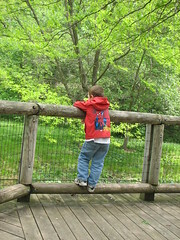 I believe they were taken at the zoo in Battle Creek. 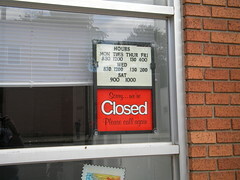 Quarter - This is a picture of the hours at our local post office. I'd say it's open about a quarter of the time a normal post office is. Beautiful blog you have! :-) Nice pictures! The car and granny photo are great! Glad to see you are still playing along.